Finally, when it comes to seeking advice, I always think of that old adage: "never take a stock tip from a cab driver". Accordingly, your life coach should have that special and indispensable quality known as experience... and if you perform an exhaustive search for a business and life coach with invaluable experience (believe me, I've done it), you'll have a very short list on your hands - not surprisingly, Denise Dema will be one of the few names on the top of that list." G. Vazzana, Owner - Pivotal Products, LLC. Denise is so motivated to help you succeed. She goes the extra mile constantly to make sure you have the tools that you need. I can't thank her enough for keeping me on the right path. “It was about 10 years ago that I first retained Denise Dema, as a consultant, to design and implement a training program for my sales staff. The program and the results were so impressive that I extended her contract, and have continued to employ her services on a periodic basis to date. I have relied on her to train new salespeople and managers, and have also brought her in to motivate and energize the entire staff - because no one does that as well as Denise. She is one-of-a-kind amazing! Her unique approach blends aspects of a teacher, life coach, creative problem solver and, what everyone needs - a motivator. I wish I had her talent, but since I don't, I'm thrilled I have her help." “Denise was referred to me by a good friend who has used her coaching services in the past with RAVING reviews. I have had a many coaches in my sales career over many years and none have pushed me to the point of achievement as Denise's coaching did. Denise's coaching technique is a complete system which helps you be a better businessperson, salesman/woman, father/mother, husband/wife, friend... you get the picture. Through Denise's questions, her understanding of the human mind, her experience at high level sales & management positions and her human soft side, she will help you self-discover your greatness to a level of amazing results in your career and personal life. In the 6 months of working with Denise, I can honestly say that I am on the way to a very successful, prosperous and fulfilling life both personal and financial. "Denise Dema has helped me sort through my personal and business life with ease and expertise; she is a great asset for any industry out there. She had a real grasp of how to solve the puzzle of balance and allowed me to see a different point of view to execute my strengths. 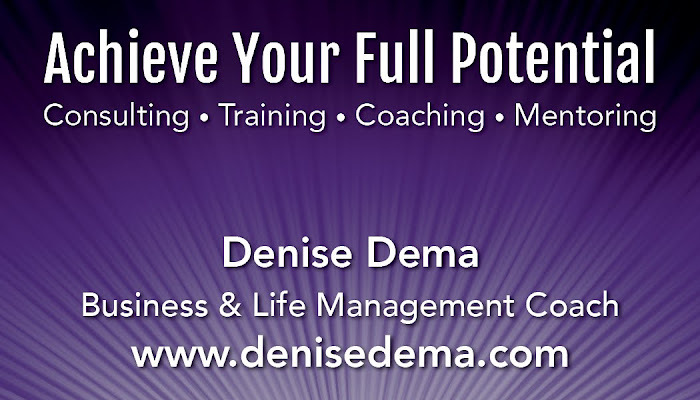 A phenomenal coach, Denise was able to help improve my business model, business strategy, and sales etiquette. I hope that everyone has the chance to let Denise work her magic and reap the benefits, professional or personal life, she has made all the difference." “I was referred to Denise Dema by a friend for life coaching. I had heard of life coaching but I did not know what life coaches do. I needed direction and to be able to focus in order to be productive. Denise helped me set some goals and work on something I already wanted to pursue. She helped me tremendously to identify and resolve a lot of issues I had that were distracting and preventing me from accomplishing these goals. It helped me to have her follow my progress and keep me motivated and on track. I am a physician and I have accomplished a lot in the past but I now realize that many people, I included, often reach an impasse and need some help to go in a positive direction. Denise has done this for me. I am grateful to my friend that introduced me to her. "When I first contacted Denise my life was in disarray, both personally and professionally. My personal life was all over the place and heading in a direction I wasn't happy with. I heard of Denise though a friend and contacted her for some coaching. After our first phone call I knew she would be able to help me get on the right path. She met me in person the first few sessions and we were able to get comfortable with each other which really helped us get on the same level. Denise keeps me accountable, creates awareness, gives me options and advice with exercises that keep me on the right path. Over the many months of working with her I've noticed some major changes in my life. Even my family members have noticed a change which is what I'm most grateful for. I am now living my life being Proactive not Reactive which has improved all the decisions I make in my personal life and business. I'm extremely happy that I found Denise and I will continue to work with her so I can stay on the right path. Denise Dema is really a great coach because she creates change. I am living proof!" "It is with joy that I commend to you, Ms. Denise Dema, Life Coach extraordinaire. When I sought the services of a Life Coach, I found three people I deemed as worthy of further exploration. I spoke with Denise first and never pursued the other two. It was clear from my first conversation with her that I had found the person that could and would help me re-focus and energize my career. I chose face to face over phone meetings as that is a personal style of mine. From the first meeting to this moment, Denise has fulfilled every hope and expectation I may have had. She is incredibly thoughtful, creative, knowledgeable, open, daring, bold and punctual. She is dedicated to my needs and success 100%. There is never a time that she is not working with and for me. I do not have to be present for her to be thinking, researching and planning on my behalf. She is supportive, encouraging and patient when I am feeling doubtful and insecure. She is always capable of taking a step back or forward depending on what else is occurring in my life at that time. Her caring and concern are sincere. It is without hesitation that I enthusiastically urge the reader to retain the services of Denise Dema in your personal, professional, spiritual or other journey to happiness and fulfillment. She will help you attain heights of happiness and joy that you only imagined." Denise Dema has been a tremendous coach and marketing mentor for my business, Worldwide Refrigeration Industries. We are a very successful commercial manufacturer of walk-in coolers/freezers sold internationally and wanted to improve our local presence through social media and develop marketing programs for niche products. Since hiring her business revenues has increased and as my business grows in other areas, I will be sure to utilize her skills to expedite the process. She has been a great advisor for all aspects of my business and I highly recommend her services. M. Montes, Owner- Worldwide Refrigeration Industries, Inc.
"I came to Denise a few months ago with the hopes of putting my chaotic life back on track and building my business into something that would sustain me and my family. I wasn't in a position to be spending money on anything, let alone a coach, but I was working night and day and not reaching my goals. I knew that I wasn't going to get ahead without some help and so I sought out Denise. Denise has given me some great steps to implement and changes to make in my daily life that have made a huge difference in not only my business productivity but also my family life. I'm now able to take a day off each week, guilt free and still get my client work done. I'm actually achieving things now that were big struggles for me before. It's a process for sure, but with Denise's encouragement and judgment free support, I'm no longer scared about what tomorrow will bring. My business is better and I am happier too. I wish I had met Denise years earlier. I really like having a cheerleader to celebrate my accomplishments with and to guide me in the direction to improve myself and make better decisions." "I was referred to Denise Dema through a friend. At the time I was having some issues with my self-confidence and since I really wasn't aware of what a life coach did - we spoke and decided to get together. I really feel that I have seen a major transformation in myself, in my personal life and business world as well. Denise has helped me in so many ways. I am very grateful and the best part is in my daily life I feel so much more confident. I am growing in leaps and bounds by stepping out of my comfort zone and experiencing so much more than ever before - she is amazing!!" "Denise is outstanding and her coaching was invaluable to me. I learned to identify the barriers and key performance issues that have been holding me back. Denise was incredibly skilled at helping me see things from different perspectives and held me accountable to achieving my goals. Denise is not only challenging and insightful, but also patient and understanding, with remarkable instincts and knowledge. She brings a rare combination of skills as a seasoned business advisor and life management coach. Her coaching style is a perfect fit for any business executive and leader who wants to perform at a higher level and the insight I learned will be invaluable for the rest of my career. I'm a much better listener in general, improved my time management, and handle myself more effectively in meetings. I would recommend Denise to anyone that wants to become more productive in both their career and personal life." "Denise is outstanding! I now have clarity on my vision and mission and I am so grateful. Denise really gave me confidence and a lot of great ideas that enabled me to excel in business, and she took a genuine interest in my performance and success. Thanks!" "Denise has helped me to achieve more of a balance between my work and personal life, and this has led to a greater enjoyment of life in general. That's a return on investment that can't be measured."